At Institute of Technology, quality education is more than a philosophy; it is the very essence of its existence. Institute of Technology is a leading institute offering multi disciplinary postgraduate & undergraduate programmes in engineering. 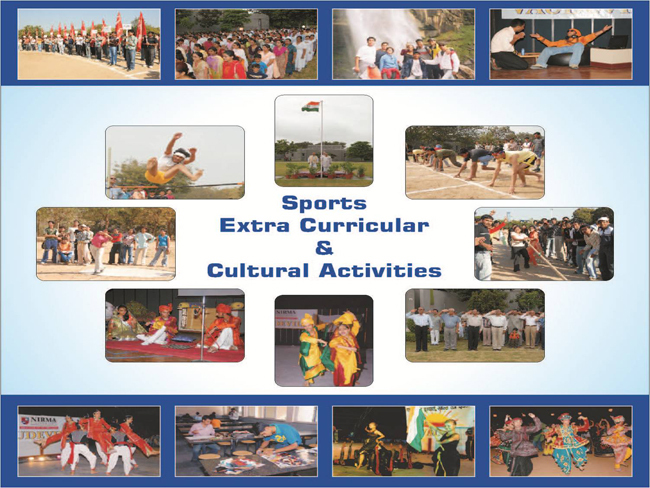 The institute was affiliated to Gujarat University till April 2003. 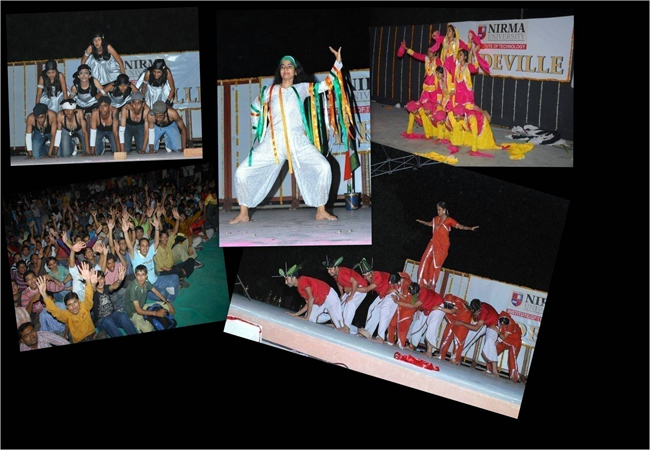 Thereafter, it has become a constituent of the Nirma University. Located in peaceful and sylvan surroundings, about 15 km from Ahmedabad, it is also easily accessible from the state capital Gandhinagar. A disciplined, serene and pleasant environment envelops the campus. It blends beautifully with the green landscaping, aesthetic elegance of arches and the vibrant pursuit of knowledge by the young aspirants. The academic ambience gives full scope for group activities, which are plenty, as also to individual pursuits for development on preferred tracks. The institute shares the Nirma University campus with four other institutions viz Management, Pharmacy, Science and Diploma Studies. All have distinguished record of achievements. 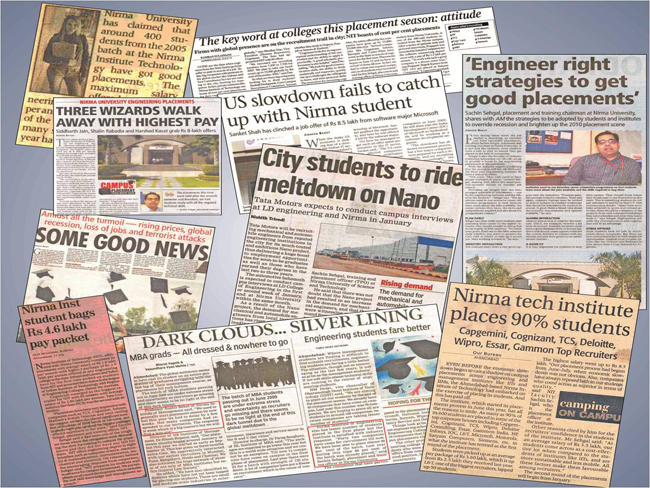 Students joining the Institute of Technology have therefore, an opportunity of interaction with the academic community of the entire Nirma University complex. The academic environment generated by the interaction between professional disciplines has a stimulating influence, especially in the formative years of young students. Exposure to such environment helps the students to develop good communication skills, an integrated personality and greater competitive spirit. 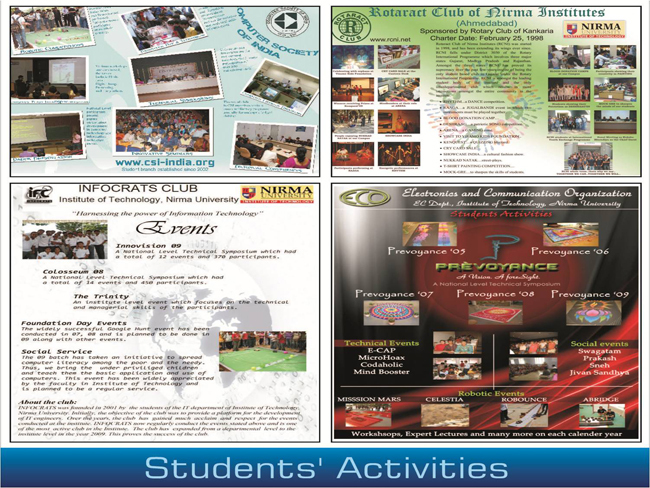 The dedication and commitment with which the students and faculty have worked over the past ten years have paid rich dividends and this has made this institute the most preferred one among the student fraternity. The students of this institute have so far been consistently securing top ranks in Gujarat University examinations. The performance of a student in the examinations is not the sole criterion of the quality of education acquired, nevertheless, it is an important indication of the effectiveness of the academic inputs. Students are encouraged to participate in national and international competitions/ events and have received appreciation by winning prizes. Placement of graduates of last five batches has been note worthy. Many are placed in national and multinational companies throughout the globe. Many students have joined reputed institutions for higher studies in India as well as abroad, to name a few, IITs, IIMs in India and Stanford, Purdue, USC, NCSU, University of Pennsylvania, Michigan Ann Harbour, FAU in USA. ICT tools and instruments are being widely used for interactive teaching learning process. All laboratories are well equipped with state of art equipments, which not only cater to UG and PG programmes, but are also very useful for testing and consultancy projects. The details are available in respective departments. Limited accommodation is available for PG Students. A fleet of 35 buses to and fro for transporting students and staff from different locations in Ahmedabad and Gandhinagar everyday. Timings : As required by academic schedule. Apart from the teaching by the faculty of the institute, the institute has set up facilities to receive lectures and courses delivered by prominent faculty members and experts at other institutions of repute. Under an MOU signed with IIT Bombay in May 2004 , the institute has set up a remote centre of the Distance education Programme of IIT Bombay, The programe is now known as Centre for Distance Engineering Education Programme (CDEEP) of IIT Bombay. 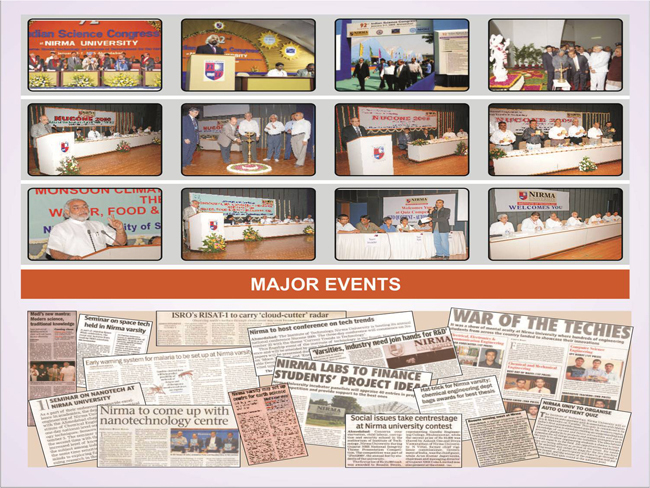 Under this programme some of the courses of PG level, senior UG level and expert lectures being delivered at IIT Bombay are transmitted live via VSAT network and received at the institute, Students attend these lectures in specially designed class room with facility to have audio and video interaction with the faculty. The network supports two way audio and video interaction. The students of the institute benefit immensely from good quality expert lectures. ISRO has taken the initiative to launch a state of the art Communication satellite to provide communication channels dedicated to education and training. Institute of technology has installed a Satellite Interactive Terminal(SIT) to participate in AICTE’s Expert lectures and courses which are delivered through EDUSAT channel. The SIT terminal is interfaced with the Intranet so that the lectures received can be viewed on any PC across the campus giving students the vide accessibility to such programmes. ISRO has signed MOU with several Ivy league Universities of US like Harvard, Yale Princeton, Cornell etc. to provide distance higher learning to engineering institutions in India. According to this MOU renowned professors from these universities will come to India and deliver courses. 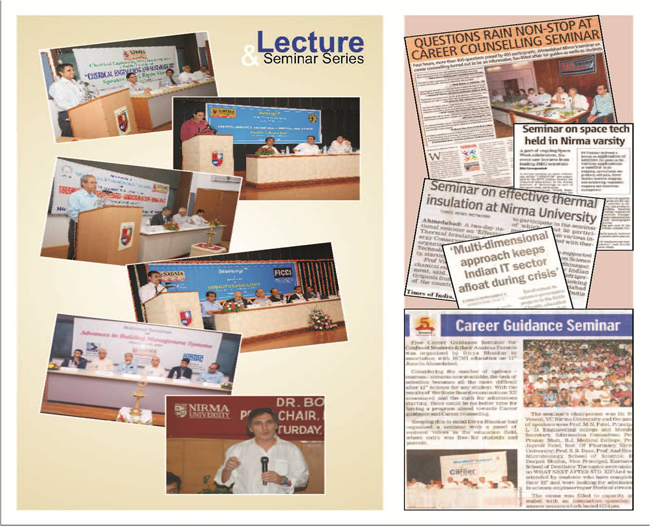 Institute of Technology, Nirma University is among of the first few institutes selected to participate in this programme. Under this MOU lectures will be beamed through EDUSAT network and projected live to the students in specially equipped class room. There will be two way audio and video communication. for interaction with speaker. Eklavya is an Educational of Govt. of India. Where lectures live and recorded are broadcast using INSAT satellite. Regular courses are broadcast from different IITs. A well equipped classroom has been set up where direct satellite broadcast of lecture is received and projected to the students. Applications are invited from the candidates for the admissions in Diploma to Degree Programme in Semester — III (Second Year B.Tech. Programme) for vacant seats. Seats are filled-up as per guidelines of ACPC. Application forms are available at Seminar Hall, "P.G." Building on payment of Rs. 350.00 by cash on date 04-09-2014 at 9:00 am to 3:30 pm. Above payments must be by way of in Demand Draft / At Par Cheques / Local MICR Cheque (The cheques should be given from the New Cheque book as per RBI instruction mentioning ‘CTS-2010’ on all cheques) in favour of "Institute of Technology, Nirma University"
* Fees are subject to revision on the basis of order to be issued by the Fee Regulatory Committee and students are required to give undertaking for the same. ** Fee determined by the Fee regulatory committee in pursuance to Hon'ble Supreme Court judgment towards the cost of revision of the pay scales vide letter No. FRC/FEE/2011-14/SC/2012/266 Dated 24th December, 2012. The copy of the said order of the Fee regulatory committee is already available on our website. 15. Caterpillar India Pvt. Ltd.
24. Denag Cranes & Components India (P) Ltd.
26. Dolcera ITES Pvt. Ltd.
41. Evolutionary Systems Pvt. Ltd.
89. Linde Engineering Pvt. Ltd.
92. Mahindra Gears & Transmissions Pvt. Ltd.
93. Mechartes Researchers Pvt. Ltd.
103. NK Shah Consulting Eng. 118. SABIC Innovative Plastics India Pvt. Ltd.